14 x 6 1/2 inches, Professionally framed photo of a silver ruble issued in 1765 during the reign of Russian Empress Catherine the Great. Obverse portrays youthful Catherine and Reverse the double-headed eagle representative of imperial Russia. From the Arthur J. Frank collection. 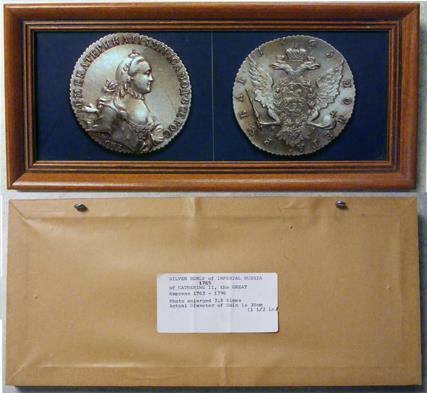 This photo of a coin in his collection hung in the office of Mr. Frank for many years. An attractive piece of numismatic history.